Next up is a brand new brand only recently set up by Charley Child, an ex-knitwear buyer who decided to set up on her own. The brand ethos is that natural and quality yarns are the starting point of design. So if the High Street offerings of man made mainly acrylic knits are not your bag then do check out what Iggy & Burt have to offer. This one is 94% cotton with a touch of wool & cashmere. Check out their great designs, this sweater is £75 (more of a mid-point price point) and it's certainly worth paying that bit extra for something a little different. Off course there are some real gems of statement knits on the high street. This ones a cotton blend from Oasis.....same place as my beloved leopard skirt! The quality is good for the price point. It's true to size in my opinion, I have the small and I'm generally a UK 10. This reminds of a Pringle sweater I picked up in TK Maxx last year that I wore to death so I know this ones a winner! So tell me! Are you trying to hold off wearing coats and jackets or are you now fully ingratiated in Autumn layers already? Just a quick heads up about an event I'm doing with Duo boots in October. 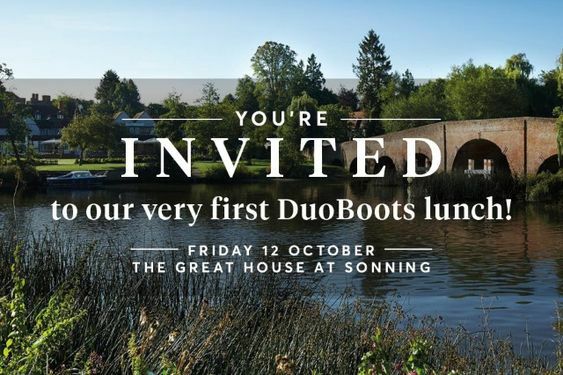 I'll be there styling up a few different styles of their new season boots at The Great House at Sonning.